This week's tutorial over on Splitcoast is this cute Witch Hat Clip - these are done with circle dies and a couple of small rectangles - they're so easy and cute! The outer circle for the hat brim is 2-1/2", so I took a 6" square sheet of cardstock, folded it in half, and cut two brims at once. From the other half of the sheet, I cut a 1-7/8" strip, folded it in 4, and cut 4 triangles at once. Just in case you're interested in making a few of these, it's easy to do them 2 at a time! 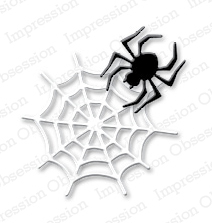 The spider die set is from Impression Obsession - isn't that cute? I cut the spiders out of felt, so they're fuzzy. Take a peek over at the tutorial page to see how Kelly uses her clips to decorate Halloween goodies! Thanks for visiting today! "Take a peek over at the tutorial page to see how Kelly uses her clips to decorate Halloween goodies! Thanks for visiting today!" No problem! I have the link in the first sentence of the post.